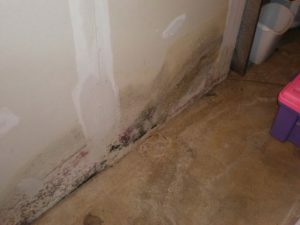 Mold growth 2′ up drywall in a laundry room caused by a leak in the bathroom above which was not discovered until it was this bad. This type of growth is preventable if the water release is detected, drying immediately implemented, and wall material moisture is reduced to normal levels within approximately 3 days. Occupants complained of allergy and respiratory irritation. June 2017 project.